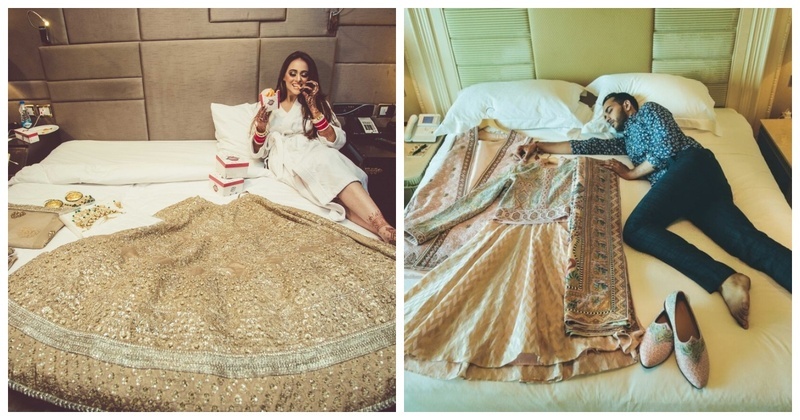 The best wedding lehenga and sherwani shots that caught my eye! Often in an array of wedding pictures, these precious little ones gets lost. Confused what am I talking about? The lehenga and sherwani shots of course! Lehenga and sherwani shots have their own charm and definitely deserve an entire blog about them! I present to you, the best lehenga and sherwani shots that captured my attention! 1. This lehenga shot clearly highlights the bride’s priorities! 2. This groom obviously preferred sleep over his wedding! 3. Here is a picture of two swaggers who slayyyed the lehenga/sherwani shot game! 4. I like how this one isn’t hanging from a wall! 5. Cookie for whoever came up with this idea! 6. Can I just shift to this location? Please? 7. This sherwani’s dreams of flying high have been achieved! 8. Swimming pool shots are my favourite! 9. The lighting is perfect for this sherwani shot! 10. Distracting the passersby with this beaut lehenga! 12. Hanging from a pole? That’s something new! 13. The lampost makes the picture even better! Next time you go through a wedding album, don’t forget to look out for these precious ones, okay?